Sometimes called the “Snowbird,” the dark-eyed junco (Junco hyemalis) is a year-round visitor to northern bird feeders. A medium-sized sparrow with a pink beak, crisp color pattern— though it varies considerably— and bright white tail feathers that flash, especially when in flight; the junco is one of the most common birds in North America. Its range stretches from Mexico to Alaska and across the continental United States. A recent estimate put the total population at about 630 million individual birds. 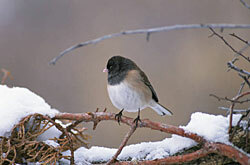 Dark eyed juncos breed in coniferous or mid-coniferous forests. In winter, you’ll find them traveling in small congenial flocks of 15 to 25 birds in open woodlands, fields, parks, roadsides, and backyards. Juncos are found in the far reaches of Alaska—they have been noted singing in spruce bog areas along the Kuskokwim River—but when the trees disappear, so do the juncos. Interestingly, juncos are the focus of research led by Indiana University behavioral ecologist Ellen Ketterson into testosterone levels in songbirds and the effect on survival and reproduction. Males with higher testosterone levels (they tend to have larger patches of white feathers in their tails, which they flash more frequently) tend to attract more mates—and produce more offspring. But scientists have found these birds are not good fathers. They don’t visit or bring food to their nests as often as their less popular rivals, and their offspring, though more numerous, are born smaller and die at higher rates. Higher testosterone levels are also associated with aggression and suppressed immunity, which can harm the male bird’s chances of survival. You can read more about the Ketterson Lab research and results in the online magazine Science Daily.